Join us for a reading group discussion of Topdog/underdog by Suzan-Lori Parks! This 2002 Pulitzer Prize-winning play, a darkly comic fable of brotherly love and family identity, is Suzan-Lori Parks's latest riff on the way we are defined by history. Lincoln and Booth are two brothers whose names are a foretelling of a lifetime of sibling rivalry and resentment. Suzan-Lori Parks is currently considered a "single author." If one or more works are by a distinct, homonymous authors, go ahead and split the author. 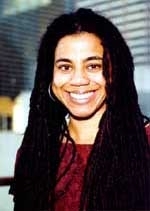 Suzan-Lori Parks is composed of 4 names. You can examine and separate out names.